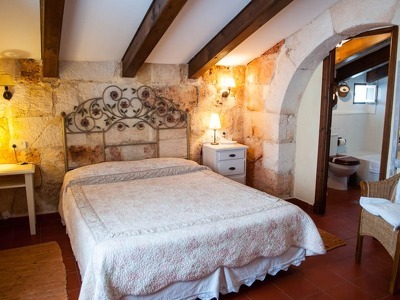 Each of Hotel Biniarroca's eighteen bedrooms (doubles, deluxe rooms and suites) are all decorated in their own unique style and there is a ground floor room adapted for wheelchair access. Garden rooms have been individually decorated by designer Sheelagh Ratliff and from their private terraces enjoy the surrounding gardens. Suites and Deluxe and Garden Doubles are on a grander scale than the Classic Rooms and the beds are king or queen size. 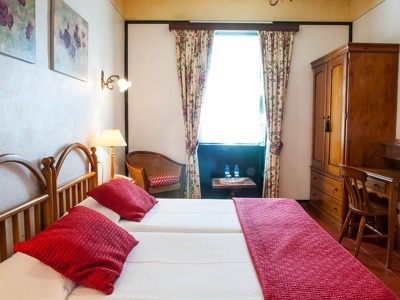 All rooms have air-conditioning, central heating, television & telephone. The suites and deluxe rooms enjoy the smaller terrace of their own private pool. The Classic Double Rooms can also be made into twin beds. They have a fully equipped en-suite bathroom. They don't have a terrace but the windows have views of the gardens or the countryside. The Classic Double Rooms can also be made into twin beds. They have a fully equipped en-suite bathroom. They have a terrace with views of the gardens or the countryside. The Superior Garden Rooms have a fully equipped en-suite bathroom. They have a terrace with views of the gardens. The Garden Suite has two double-bedded rooms and two en-suite bathrooms. It has a private terrace and is located in the gardens. Hotel Biniarroca has one thing that no star rating at any boutique hotel can grade; charm, and it comes in abundance. A post-impressionist artist and a fashion designer discovered this dilapidated 15th-century farmhouse, and 5 years later it became a delightful small hotel for adults only. Set in the countryside, it's only a10-minute drive from the sea. The hotel is beautifully decorated, with many furnishings from the local antique shops of Mahon. Hotel Biniarroca is highly recommended for anyone looking to recharge their batteries in style. Not suitable for children under 16. The foresight and sensitivity of the owners of Hotel Biniarroca made the creation of the gardens their first priority. Mature rose gardens, luxuriant lavender bushes and abundant bougainvillaea create the botanical backcloth worthy of this lovingly restored hideaway. It's the perfect spot to read a book, be contemplative or simply sit and soak in the surroundings. Help yourself to a cool drink from the bar and take a refreshing dip in one of the two swimming pools. The freshwater swimming pool is surrounded by flowers, while the Roman-style, green tiled pool enchants the onlooker with a myriad of reflections across its shimmering water. For the ultimate relaxing experience, the resident therapist is on hand offering massages. If you are looking to venture out of the hotel, horseriding, hiking, biking and cycling can be arranged, as can boat and car hire. Over the last 10 years, Hotel Biniarroca has gained an outstanding reputation for unique and high-quality food, attracting a host of A-list celebs. Biniarroca Restaurant is an exceptional restaurant set in the beautiful rose gardens of the hotel. The chef offers classic dishes with an innovative Mediterranean touch, all of which can be served in the romantic dining room or on the delightful garden terrace. At breakfast, homemade cakes, fresh fruit and local cheeses are served on the terrace. At night, candles, soft music and the rose-scented gardens transform the scene into a sophisticated dining experience. From the airport, take the main road to Mahón, and then to Sant Lluís.On this road, at the second roundabout turn left into the industrial estate - polígono industrial (big supermarket on the corner). Proceed through the estate until just about the end of the street, where you will have to drive slightly to the right. There, turn to the left (signposted “hotel rural”). Approx. 500 metres turn left again down a small lane (also signposted). The hotel is approximately 400 metres down the lane on the left. Biniarroca is an adults only hotel. 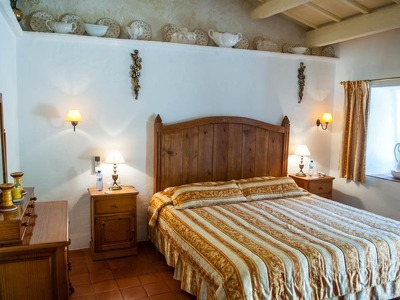 Each of Hotel Biniarroca's eighteen bedrooms (doubles, deluxe rooms and suites) are all decorated in their own unique style and there is a ground floor room adapted for wheelchair access. Garden rooms have been individually decorated by designer Sheelagh Ratliff and from their private terraces enjoy the surrounding gardens. Suites and Deluxe and Garden Doubles are on a grander scale than the Classic Rooms and the beds are king or queen size. All rooms have air-conditioning, central heating, television & telephone. The suites and deluxe rooms enjoy the smaller terrace of their own private pool. Superb friendly service. First rate food and drink. Clean and comfy rooms with power showers. Great pool area and gardens. Walking distance to supermarket and local town but not really to the beaches. If you hire a bicycle, scooter or car then the standout beaches are Es Grau, Cala En Porter and Cala De La Olla. One the best and finest eating establishments in the Balearics. I can't comment on the accommodation as I've never stayed overnight. Howevere, I can say that the whole place is very, very classy. The food is quite exceptional and beautifully presented. The staff are of the highest standard and so friendly and professional...they make you feel 'special' from the moment you enter. I cannot recommend it highly enough and would urge you to spoil yourself at this amazing venue. Please note that booking is required. Outstanding. A beautiful place with fantastic staff. I completely understand why this place gets so many repeat visitors. Really sad to leave. My first rural experience! It was awesome, chill, the silence, the hotel, the staff and the most important THE GARDEN! Totally recommended, very good breakfast! Also you can have launch and author dinner! We went for dinner out of curiosity, looking for good food and booked immediately for the following evening, we were that pleased and impressed. Food, wine, service - exceptional. We found the ambience tranquil and comfortable. Easy might be a good word. The team, under Carlos, is exceptional. We haven't stayed here but if you're looking for good non-touristic food at a good level then we recommend the restaurant. Perhaps we'll come and stay next time? Thanks to L'equipe Biniarocca.